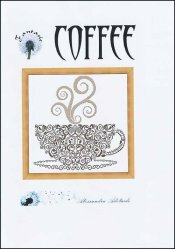 Coffee [H5598] - $15.28 : Yarn Tree, Your wholesale source for cross stitch supplies. Cross stitch pattern from Alessandra Adelaide Needlework. Steam is rising out of a beautiful coffee cup. Stitched with three colors. Stitch count 161 X 161.